Graham Nolan, it is safe to say, is a beach boy. Growing up between Long Beach, NY and Indian Harbour Beach, FL, the idea for Sunshine State came quite naturally. 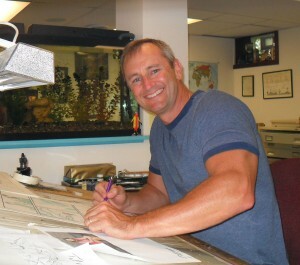 Nolan started his career writing and illustrating comic books for Marvel and DC Comics. He was a top Batman illustrator for 6 years and is the designer and co-creator of the iconic Batman villain, BANE. Later he transitioned into the newspaper strip arena illustrating REX MORGAN, M.D and THE PHANTOM for King Features Syndicate. Currently, he is back writing and illustrating comics and graphic novels as well as working on the project that has given him the most joy of his career…SUNSHINE STATE!